BIRMINGHAM, Alabama – Why should Alabama politicians care about issues within the state prison system? Why, for that matter, should residents care? What's being done now to fix the problems, and what are the potential consequences if they aren't adequately addressed? No one has all the answers, but state Sen. Cam Ward has increasingly familiarized himself with the system and the players during the past five years of his political career. A team of AL.com reporters, collaborating with the Center for Investigative Reporting and WBHM, are taking a closer look at the state prison system as part of the Alabama Investigative Journalism Lab. Last week, WBHM's Rachel Osier Lindley sat down for a lengthy talk with Ward, a Republican from Alabaster and chairman of the state legislature's prison oversight committee. Their interview addressed the prison system's history and how legislators and state officials can remedy current challenges. Prisons aren't exactly a fun or popular cause for a person to take up in the legislature, so what first got you interested in prison reform? Ward: "First of all, no one's ever run for election or re-election on the issue of how to solve prisons. I can tell you it's not a big issue in the minds of voters, but it should be. When you look at the rising costs of prisons in Alabama and you look at the issue of overcrowding and how... out of sync we are with the rest of the country, what it makes me realize is that if we don't do something about it soon it's going to create a huge, huge problem for our budget in the future. You know we love to proclaim ourselves to be a state that prides itself on the 10th Amendment but we would really be disregarding that pride we have if we totally let the federal courts come in and take over our prison system, and I think that's what's on the verge of happening. So I think we have to step up and make some bold political choices or else we're going to have a third or fourth of our general fund budget controlled by the federal government." "We have to make some bold political choices or we're going to have a third or fourth of our general fund budget controlled by the federal government"
What kind of political heat do politicians take when working on prison issues – showing compassion to people in prison – and what kind of pressure does that put on you? Ward: "Well it is a lot of pressure but if you look at what other states have gone through, you look at Texas, Kentucky, Georgia. Those are... so-called red states that tackled sentencing reform and it worked out great... They saved money. There's a lot of political pressure because there's a stigma there that you're soft on crime if you want to somehow resolve the prison problem. No one's being soft on crime; you're trying to be smart on crime... And as a state that loves to advocate for the bill of rights we talk often about the 1st, 2nd and 10th amendment but there's still a 3rd through the 9th amendment that we have to advocate for and the 8th amendment it clearly lays out cruel and unusual punishment, and if we violate that then the federal courts are going to take over... I'm not advocating for a prisoner to have certain rights over someone who hasn't committed a crime but if we don't maintain those basic rights a federal court's going to do it for us... It's not a politically popular position, but I think it's gaining traction with the awareness we're raising." Right now the state prison system is under investigation. Do you feel like you or other members of the Alabama legislature's prison oversight committee are personally taking heat for this investigation by the Department of Justice? Ward: "I think we have a responsibility to respond and do what we can to correct the system and if there are violations taking place that violate someone's rights under the 8th amendment then we need to step up... I have an obligation as a policymaker to make sure we're enacting or engaging in policy matters that are in compliance with the constitution and also good for the state, our state budget and our state system, so we're not catching personal heat but my opinion is we should be more concerned than we have been." In January, the Department of Justice contacted Gov. Robert Bentley about what they characterized as unconstitutional conditions at the Julia Tutwiler prison in Wetumpka. How did this change the tone of the legislative session for the prison oversight committee? Ward: "I think it's raised the awareness level... For years going way back to the early '90s, there was a perception that we had to be tough on crime and forget everything else, and we should be tough on crime. There's no question about that, but we should also be smart on crime. I think what Tutwiler did was raise an awareness of 'Hey, we may be looking into a deep black hole that if we don't do something now we're going to fall off the edge of the cliff.' I think it raised an awareness level that some reforms are needed and if we don't engage in those reforms then we're going to pay a big financial price down the road for our state." And during the 2014 legislative session the Alabama legislature passed a resolution that is creating a task force and that will work with the Council of State Governments on prison problems. What exactly will that task force do? Ward: "In the past if you look at other states that have successfully navigated through the prison crises that they had, what they did was they had a group – Council of State Governments, which is a bipartisan group of policymakers from around the country – they had that group come in under their justice institute plan and... study your corrections system and make recommendations. It takes about an eight-month study, but they come in and recommend policy, sentencing reform, facilities – everything from A to Z in your system, what you can do to fix it and make it better. But they require you to have a task force of local officials, of local stakeholders to work with them, so the task force we created was to set the stage for them to come in and work with us, to make sure we had a group in place that's going to be very serious about... coming up with some real solutions and real ideas. And I think 2015's going to be the high water mark for sentencing reform in Alabama." Sentencing reform is a big issue that you talk a lot about. What do you think that Alabama gets wrong with sentencing? Ward: "There's a lot of disparities in the way we classify certain crimes. There's a disparity in how we classify crack cocaine as opposed to powder cocaine. They're both cocaine, yet we have different penalties. We have this notion in our mind that somehow, someway a nonviolent offender should get the same amount of time as a violent offender... Someone who commits a crime should be punished, there's no question about that. I think it's the degree of punishment what we're looking at. For example, it costs you $41 a day per inmate to put in the state prison... however, I could put that same nonviolent offender into a community corrections facility and it costs you $11 a day. Why wouldn't you take a nonviolent offender, save $30 per day per inmate putting them in a community corrections facility where they have to work and basically pay back their restitution, as opposed to putting them into a $41 a day lockup that quite honestly does nothing but create a masters' degree in criminals?" Another thing that you are very passionate about besides sentencing reform is community corrections, and what does community corrections mean? Describe what that would look like for Alabama. Ward: "Community corrections is different per county because every county has a different need... In Shelby County, for example, we have a very large heroin problem... so a community corrections program there may look like one where they stay, they work during the day and there's drug testing available for them... but also they have to go through rehabilitation, drug counseling and the like. Part of their work (would) help fund the facility they're staying in at night. It's a minimum security facility so... you don't have the same security enhancement costs as you do at a maximum security facility." When did the prison issue start becoming a bigger problem in the state of Alabama? Ward: "10 to 15 years ago as the population of inmates boomed; however, we first really started getting involved in it in the legislature probably too late, probably about two or three years ago. Two years ago was when we started seeing an uptick in the issues. The crowding issue has been growing for many years. We're at 192 percent capacity; however I would say that where it really started coming to a head was the first time we had some abuse allegations in Tutwiler. This was pre-DOJ report. We had some abuse allegations there but we also had some inmate-on-inmate violence in a couple other facilities, Donaldson as well as Elmore... We called a joint oversight committee meeting, met with the commissioner, met with the various wardens, talked to them about the issue. They agreed there were some things that needed to be addressed with the limited resources they have – security cameras, guards in training, just a host of issues – and then about a year ago, I would say when the DOJ started their investigation, we started becoming more engaged as far as touring the individual facilities, looking at... what needs to be addressed... There is one important thing to remember though – the DOJ report was based on a tour they did roughly a little over a year ago. All that's being reported on now, what their study was based upon was roughly a year, year and a half ago. There's been a lot of changes since their report took place." So then that takes us into the legislative session for this year, when the Alabama legislature passed a resolution creating a task force to address some of these issues. And then earlier this month Gov. Robert Bentley announced that the state would be hiring a consulting firm to work with the state on addressing problems at Julia Tutwiler prison, and the state will also be working with the Council of State Governments justice center and a few other groups. What is the significance of the state doing this? Ward: "First of all the biggest significance is that it's the first time in my 12-year career that I've seen the state actually take that seriously. It shows that we recognize there's a problem... and we've got to do something to fix it... I think 90 percent of the issue is awareness and recognizing the problem. Second, I think... it's going to give us a blueprint to go forward... We could throw a lot of bills against the wall and see if they stick, but at the end of the day if you really want to fix it you need to make sure you know first what statistics show, what is a data-driven solution to the problem... I think the big challenge, however, will be in 2015... The people that are going to be on the task force are going to be a broad group of folks... You're going to have all the way across the political spectrum, and I think you have to have that to have legitimacy and make the task force work. But the real challenge will be once that group produces a report and the Council of State Governments produces their report... that means next session it's going to require some real courage on behalf of lawmakers to pass these reforms." The Council of State Governments Justice Center – tell me more about that group. Ward: "They have been the leading driver behind prison reform across the country. They come in and they study the system. They get down to the details of data – your inmate incarceration, how many are nonviolent, how many are violent, what crime did they commit, how often do you have people coming back into the system after they've been released. They look at that and say 'Here's a set of recommendations' and the states that have adopted their recommendations have done very good... Now it won't happen overnight, but... over time they have adopted their recommendations, reduced their populations and at the same time saved money and had no increase in crime." So what do you think it'll take for us to move forward? Ward: "It took us years and years of neglect and kind of burying our heads in the sand to get here. It's going to take many, many, many years to get back out of it. I don't think it'll be one bill. I don't think there's going to be one budget proposal. I think you're looking at probably 12, 15 different proposals which, over time, will help us get out of this problem we're in. No one wants to be soft on crime. 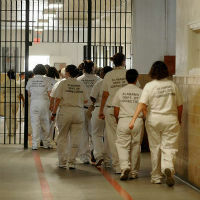 No one's out there saying prisoners are more important than victims; however, there are certain 8th amendment challenges we have that we have to comply with, and if we don't do that then the state of Alabama will suffer the financial consequences for generations to come."